Bad weather got you down? Find out a trick that can help. January is all about fresh starts, resolutions, and kicking off the year with optimistic vibes. However, it comes at the low-spirited time of year, following the well-deserved festive break. The cold dark mornings could affect your mood, but with a little help from some bright warm, uplifting fragrances, we can perk up moods and fill our homes with a little joy. Scented candles help banish the big bad blues and give you a little pick-me-up. The power of scent can have one of the biggest impacts on our mood, emotion, and well-being. January is well-known for its dark, dreary days making us lethargic and down. So why not use the power of scented candles to improve your mood? When we inhale scent molecules, they travel through the nasal cavity to the olfactory (sense of smell) receptors, which are connected to our limbic system in the brain. This triggers emotion, so the right fragrance can make all the difference. The best scents to invigorate us are from the mint and citrus families. Peppermint, spearmint, basil, and eucalyptus provide us with quick stimulation. Lime, orange, and grapefruit offer citrus notes for revitalising. For an extra dose of energy, use rosemary, geranium, cedar, cinnamon (brings mental clarity), and vanilla (sparks feelings of joy and happiness). If you’re finding it hard to concentrate, feel mentally blocked, or distracted and you need to tap into creative powers, then burn candles with lemon, orange, grapefruit, lemongrass, bergamot. Mood can be improved by the ambience a candle can give. Group them together to light up dark areas in the home or workplace – and you could even include them in your ceremony or reception décor. It is well-known that using pure essential oils in candles provides health benefits, some of which can be antibacterial and antiviral. For example, burning candles with tea tree oil will help to keep colds at bay, which can be especially helpful during the cold and flu season winter brings. 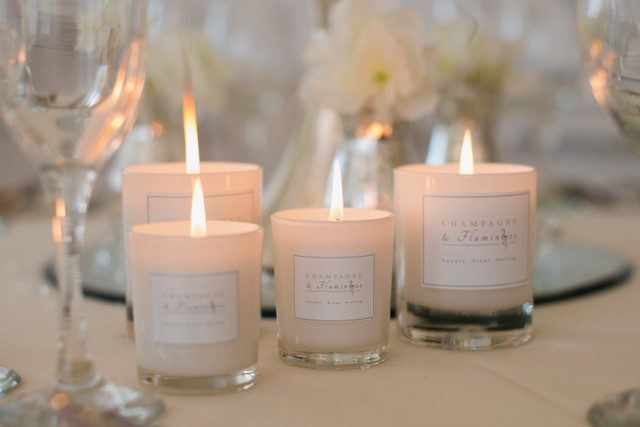 Learn how to use scents in a proposal and get ideas for winter wedding color schemes.